Think about this concept for a second: a hair wax that is actually a powder. Whaaaaatttt? 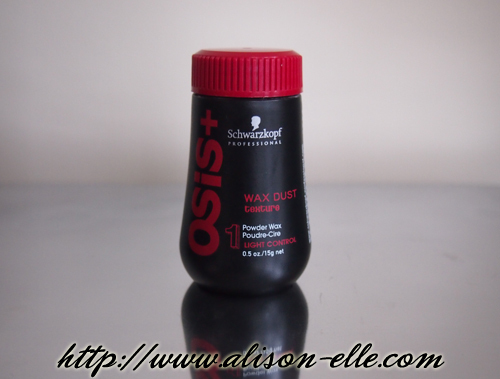 Ever the innovators in all things hair, Schwarzkopf Professional recently launched OSiS+ Wax Dust ($23.50 CAD), a new product that is kind of incredible. Like the popular Dust It, Wax Dust comes in a small 15 g shaker bottle. However, the powder inside is formulated to transform into a light creamy wax consistency in the palms of your hands. This means you get all the benefits of a wax while maintaining a dry, texturized style that's remouldable and without the heavy buildup. To use it, I typically sprinkle a small amount of powder directly onto my hair and use my hands to work the product through, twisting strands to create texture as I go. It's important not to use too much product as it can get a little sticky -- particularly at the roots if your hair tends to get greasy. Wax Dust also has no discernible scent and blends in easily despite being white in colour so you don't need to worry if you've got dark hair like me! This product sounds interesting! Thank you for sharing. What a cool idea! This sounds great. I'm glad you like it, and usually I stay away from powders because of my dark hair (I feel you girl), but this sounds like it blends easily. I just got an OSIS Duster Velvet shine powder that I am super excited to try now! OSiS+ is such an awesome brand, isn't it? Let me know how the Duster Velvet is!